I make special cakes for my kids' birthdays. Kate's is Berry Angel Delight, and Brooks' is Pumpkin Praline Torte. I had a few requests for the recipe for Kate's cake, so here it is! 1) Beat whipping cream and sugar in chilled medium bowl with electric mixer on high speed until stiff peaks form. Fold in yogurt. 2) Place cake pieces in large bowl; fold in yogurt mixture. Gently mix berries together in medium bowl. 3) Spoon half of the cake mixture into 9-inch spring-form pan; press firmly in pan with rubber spatula. Top with half of the berries. Repeat with remaining cake mixture; press with spatula. Top with berries. Cover and refrigerate at least 4 hours or overnight. 4) Run metal spatula carefully along side of dessert to loosen; remove side of pan. Cut dessert into wedges. Makes 10-12 servings. Oh yum!! One of my favorite childhood desserts was when mother would take an angel food cake, slice it in half, put softened vanilla ice cream between the layers, wrap it all up in tin foil and freeze. The next day she'd slice it for us. Ah, it was so good. 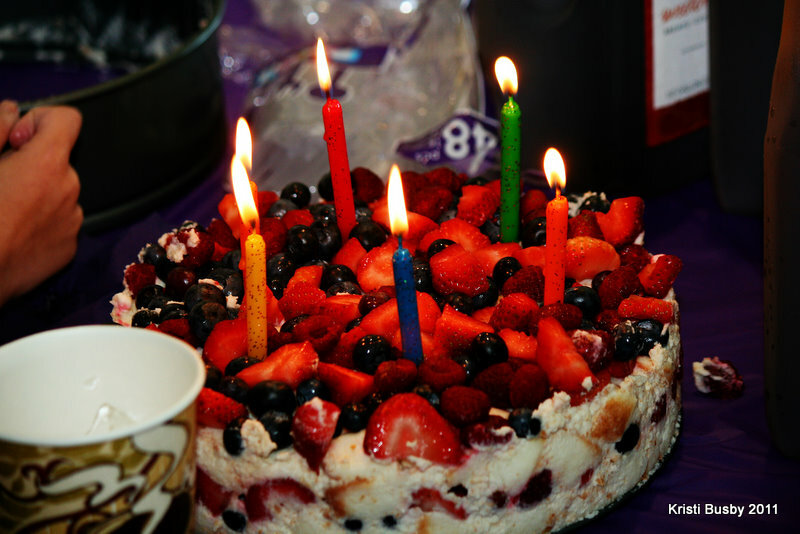 Thanks for bringing a heart memory to my tonight :) Your berry cake looks delish!